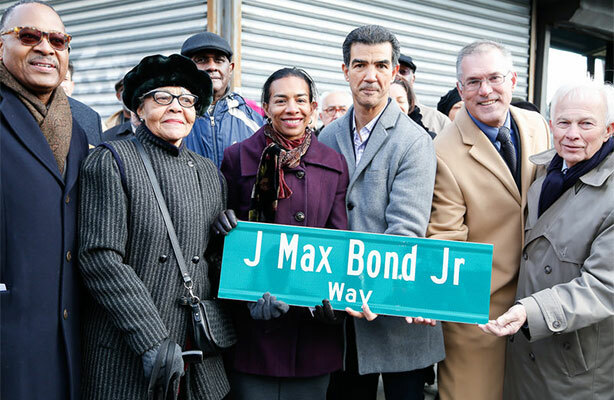 Street Co-Naming Honors J. Max Bond Jr.
Photo courtesy NYCOBA/1982 Creative Studios. On November 19, former CCNY dean of architecture and visionary architect and activist J. Max Bond Jr. (1935-2009) received a quintessential New York honor: The southeast corner of West 162nd Street and St. Nicholas Avenue is now J. Max Bond Jr. Way. Bond led the architecture school from 1984 to 1992. He is also the namesake of the Spitzer School’s research and design center.